Aoyama Parade Ground, c. 1905. “The usual new year’s military review took place at 10 a.m. on Jan. 8th at the Aoyama Parade Ground. The Emperor was present, escorted by Princes Higashi Fushimi and Fushimi the younger; Marquis Tokudaiji, Grand Chamberlain; Viscount Tanaka, Minister for the Imperial Household; General Baron Okazawa, Chief Aide-de-Camp; and other distinguished personages. In 1873, after destruction of the feudal daimyo [provincial lord] residences, the grounds at Hibiya became a parade ground for the Imperial Guard. 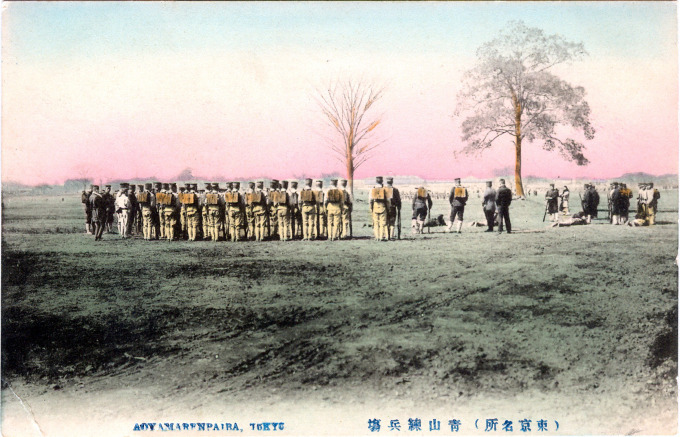 When it was decided to turn Hibiya into a public park (after surveyors found its landfill soil was too soft to hold the weight of government ministries, as originally planned), the parade ground was moved to Aoyama and the area became known as a heitai machi – a “soldiers’ town”. 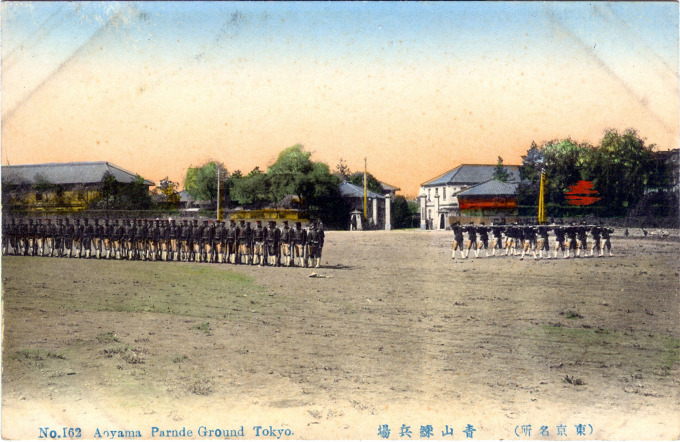 The parade ground was, in turn, removed to Yoyogi, on the western edge of the city, in 1909 when it was planned that the Aoyama grounds be turned into an exposition site for the proposed 1912 Grand Exhibition of Japan – postponed to 1917 because of Emperor Meiji’s passing and, then, never held because of the onset of the Great War. “Before departing for the front as head of the Second Infantry Brigade, Nakamura inspected his men at Aoyama parade ground and admonished them in ringing tones. ‘For the duration of this war, let the word ‘retreat’ be obliterated.’ Famous in the army for his musical voice, he spoke so loudly that his words carried to every corner of the parade ground. No doubt memories of his younger days in the Satsuma Rebellion moved him to admonish his men this way.